Jamis Renegade Elite: Getting Rolling- by Guitar Ted The “gravel” all-road segment of bicycles, arguably non-existent not more than five years ago, now seems to be the hottest segment in cycling. Well…..non-motorized cycling, at any rate. Sea Otter, which is the annual festival held near Monterrey, California every April, was rife with gravel/adventure bikes. It showed us that the niche is the focus for many companies. Right about at the same time Sea Otter was happening we were sent a brand new, stealth black Renegade Elite from Jamis Bicycles. Jamis isn’t new to this genre and they have a wide range of bicycles in this niche. The bike Jamis sent us is representative of the genre’s maturation from steel, more retro-inspired rigs to the now more commonly seen carbon frame and fork bikes with weights that are far below those of the bikes used five or more years ago for gravel riding. The Renegade Elite sports tubeless wheels, hydraulic disc brakes, and a sub-20lb, ready to ride weight. All things unheard of not long ago. Let’s get to know this rig a bit better, shall we? 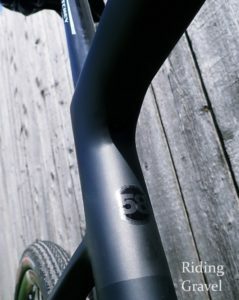 The rakish profile of the Jamis Renegade Elite leaves no question about its use of carbon fiber for the frame and fork. Size Specific Frame Design: Jamis uses three different bottom bracket drops, rear center measurements, and fork offsets depending upon size. BB386 EVO bottom bracket with press fit bearings. 27.2mm seat post. Frame is designed with Stealth dropper post routing. Jamis’ ACE internal cable guide system, Di2 compatible. Fender, rack, fork mounts. Frame has three water bottle mounts. 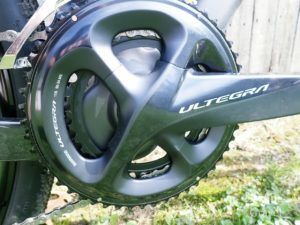 The bottom bracket area is so large on this bike you cannot see air between the chain rings on the R8000 Ultegra crank set. The running gear on the Jamis Renegade Elite is Shimano R8000 Ultegra with the new Shadow style rear mech. The crank set is a double with 50/34T chain rings. The cassette is an 11 speed 11-32T spread. Braking duties are handled by the Shimano Ultegra BR-8070 calipers and Ice Tech Freeza RT 800 rotors. Those rotors are Center Lock, of course, and are mounted to a set of tubeless compatible American Classic RACE wheels with a claimed 24mm inner rim width. Those wheels came shod with Clement (Donnelly) MSO 36mm tires with 60TPI casing and folding beads set up with tubes out of the box. The finishing kit on the Renegade Elite is equally impressive with Ritchey Design components at the handle bar, stem, and seat post. Fizik got the call on the handle bar tape and saddle. The saddle is an Aliante with Fizik’s clip system for saddle bags. The tape is Fizik’s MicroTex soft touch and it comes with gel pads to over wrap with the tape to help with comfort. The frame is carbon fiber, of course, but here is the specifics on this frame for you via the Jamis webpage on the Renegade Elite. Jamis claims some special technical sorcery has made this fork more gravel road friendly. 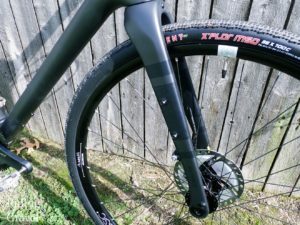 The ECO (Enhanced Compliance Offset) fork is interesting. Jamis claims that it has swept the fork blades forward “several millimeters” to enhance vertical compliance. This is done with a reinforcing internal rib which works with the through axles to retain lateral stability and not take away from the vertical compliance. Also noteworthy are the two sets of mounting bosses on either fork blade for low rider rack mounting or for two extra bottle cage mount points. The fork also features fender mounting bosses as well as a hole for a center bolt mount on the fork crown. The test sample RidingGravel.com received is a 58cm size and with Shimano SPD clipless pedals installed, tubes in the tires, ready to ride, the weight of this bicycle is 19lbs, 12 ounces. That’s pretty light for a gravel bike. 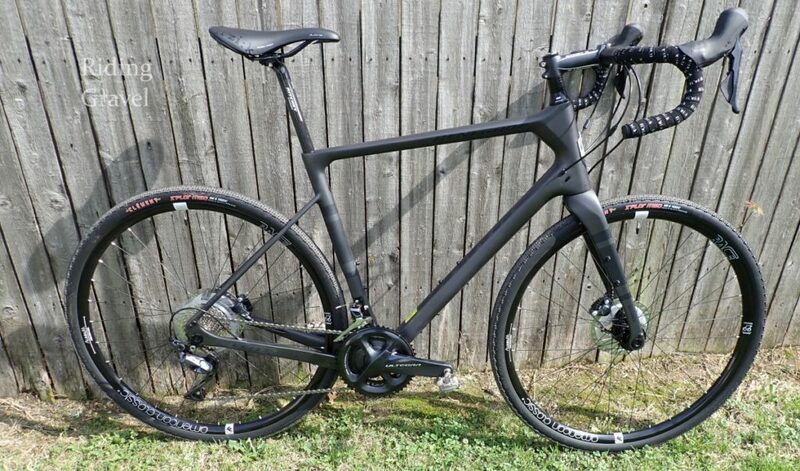 MSRP on the Jamis Renegade Elite is $3899.00USD. First Impressions: So, yeah……..it is a light bike. I’ll leave that up there first off. But beyond that, the Renegade Elite strikes a very angular, rakish profile with its odd head tube, lowered seat stays, and flattened top tube. The subtle, matte black look adds to the ultra-modern looks here. Throw some skinny tires on this and no one would bat an eyelash at you if you told them this was an endurance road bike. In fact, it would make an excellent choice for such a pursuit. That dratted seat wedge bolt is up in there…..in the shadows…somewhere. The bike went together out of the box well, but there are two things worth noting here that I should pass along. First, I did not use the gel pads under the Fizik tape. I’ve done my time with such pads and I do not get along with them. Secondly, and more pertinent to this review, I disliked the seat wedge bolt location. I get that the rakish lines and clean look of the carbon frame are preserved by using a seat bolt wedge instead of a traditional seat collar, but putting the bolt to tighten the wedge up underneath of the top tube/seat tube junction just makes this a pain in the you-know-what to get at. Bah! I would have rather seen that bolt on top of the top tube next to the seat post, but perhaps this was not a good place due to aesthetics and maybe would allow water ingress. A small nit, but if you are one to fiddle with seat height adjustments, this is a design choice you will probably not appreciate. The limitation to 40mm tires is advisable to heed if you like to have some mud clearance. This frame doesn’t have a ton of room and the way the rear of the bottom bracket, where it flows into the chain stays is designed, it will be a perfect place to collect mud and debris. A bigger tire will only exacerbate that issue. 36mm tires are racy, for sure, on a gravel bike, and that fits the profile of this rig, but the capability for bag mounting and racks seems a bit at odds with this limitation. That said, I’ll try something in a true 40mm size here later into the review to verify the tire fitment claims. By the way, Jamis does not make any overt claims for or against 650B tires on these bikes. This will be investigated and I’ll report on that in my next update. 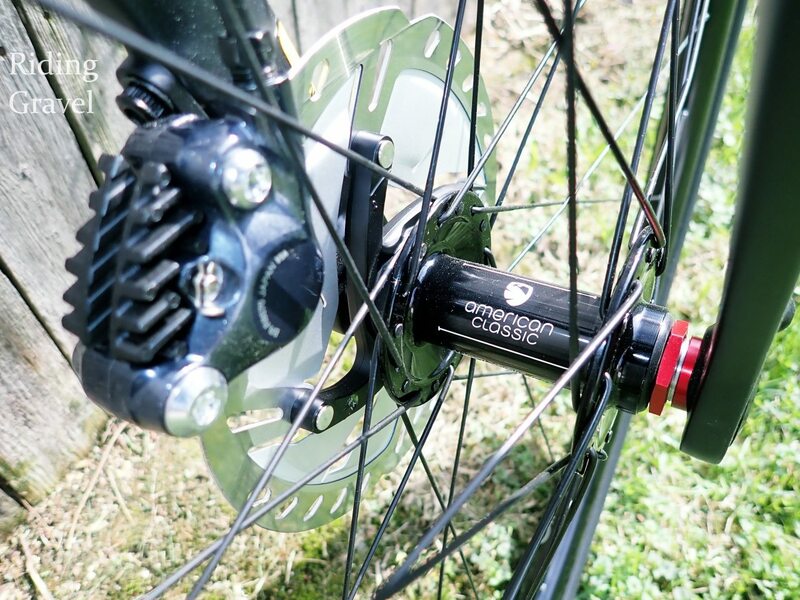 The Ice Tech rotors look odd, the American Classic hubs are smooth as silk, and that ECO fork? Can’t wait to see if the claims are true….. If I were fast, competitive, and had money I would buy this bike. How is the clearance at the crank arm and chainstay on the non drive side? Asking to see if a stages power meter would clear ? I know a stages can not be used on the new checkpoint from Trek. @J.M.- I’m going to call it 14mm at mid-arm. It’s fairly consistently that distance except for the last bit where the pedal spindle interfaces with the arm. I can’t see how a stages crank arm wouldn’t fit. I have no problems using a Garmin cadence sensor and there’s oodles of room to spare. BTW Ted, I’ve mounted up G-Ones (38c) and the new Donnelly Strada USH (40c) and both measured 42mm wide. They fit the carbon Renegade, but with only about 2mm of clearance near the left chainstay. Yes, a stages power meter will work. I installed one last week on mine and it worked without any issues. Ok appreciate the replies. Sounds like more than enough room to clear. AC wheels are great rollers, but they have so many proprietary parts. I would be a bit concerned about being able to service the wheels, since the company folded. The parts went quickly and just dont’t seem to be out there anymore.